Let me start off by saying that voice control is nothing new. Apple didn’t invent the technology. What makes Siri different is how popular it has become. It is not limited to only phone related functions, but can pull valuable information from the web too. For a worthy contender to match its capabilities will take some serious horsepower. Enter Microsoft’s Tellme. Once the feature was introduced into Window’s Phones, many have wondered how the pair matches up. The short answer is: it doesn’t. Although, you can use the same commands with both assistants to voice out a text or ask for a web search, Siri does it more efficiently and with less error. Microsoft isn’t new to the voice command technology. They have had it available on phones before and introduced it to their Kinect accessory before the iPhone 4S even shipped. I have used the feature on my own Xbox and it suffers the same condition as Tellme. It suffers a hard time understanding you unless you overly enunciate every syllable. Microsoft needs to step up their game if they’d like to compete with the popular Siri. Although they have taken a step in the right direction by introducing the feature, more work is needed to be more user friendly. That isn’t to say the purchase wasn’t profitable. At $200 for each iPhone, it took Apple only a day to recoup the acquisition. For those shopping for a new phone, Windows Phone 7 powered devices are worth checking out. They have pretty neat features such as Live Tiles and a worthy game network. However, if voice commands are important to you, you should probably stick with Siri, for now. If you’d like to see Tellme versus Siri in action, feel free to check out a pretty cool video TechAU has put together. 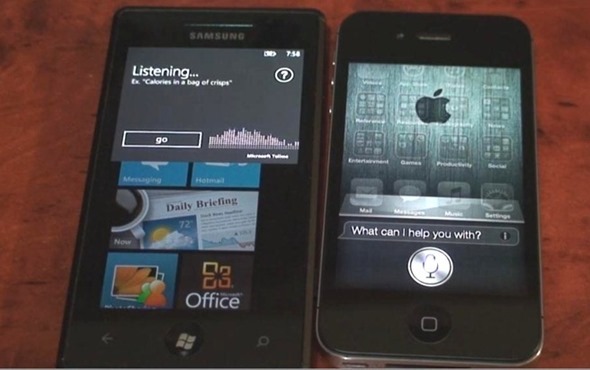 They demonstrate how the two different technologies pair up with using the same voice commands.